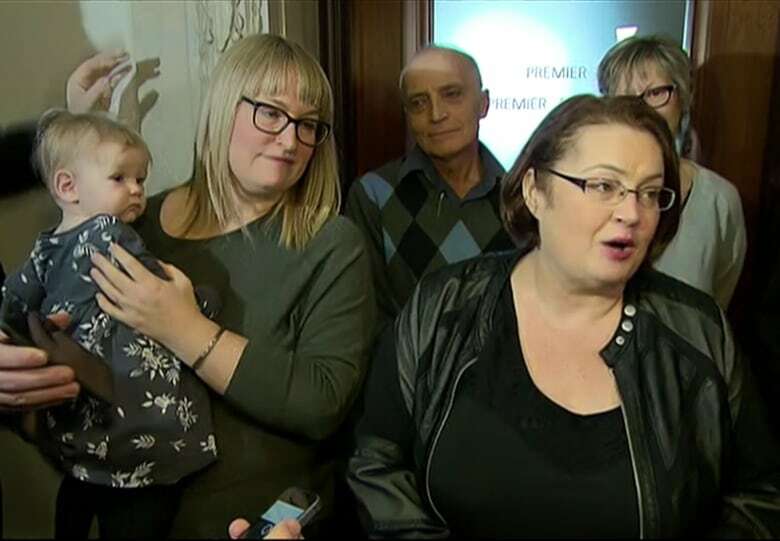 Former Manitoba finance minister Jennifer Howard is not seeking re-election so she can spend more time with her family, she said Wednesday. Former Manitoba finance minister Jennifer Howard is not seeking re-election. The MLA for Fort Rouge said her priorities have changed since she had children, and she is choosing to spend more time with her family. Howard said she has taken a job in Ottawa that she declined to discuss and will be moving there with her wife, Tara Peel, and their two children, four-year-old Harry and eight-month-old Georgia. Jennifer Howard's wife Tara Peel and eight-month-old daughter Georgia attended her announcement today. The MLA said she wants to spend more time with her family after having two children. (CBC)"It was not an easy decision; probably one of the hardest decisions I've ever made," Howard told reporters on Wednesday afternoon, with her family and Premier Greg Selinger at her side. "I've loved being an MLA," Howard said. "It's been a tremendous privilege that I never thought I'd have." The decision was not about politics, she said; it was personal. Howard said she believed she would be re-elected in April. "I ran for the nomination. I was committed to running. I had a good team. We had good fundraising," Howard said. Howard was part of the so-called "Gang of Five" — along with Andrew Swan, Theresa Oswald, Stan Struthers and Erin Selby — that resigned from Selinger's cabinet and challenged his leadership. All but Swan have said they won't run in the April 19 election. "I am very sorry that Jennifer will not be running again," Swan said in an email Wednesday. "She has been an important part of our caucus. She is principled, bright, witty and an excellent debater. We all come to the legislature with different stories, and hers has inspired me." My best wishes to <a href="https://twitter.com/howard_jennifer">@howard_jennifer</a> as she moves to a new challenge. She's our moral compass, the best of MLAs &amp; indeed the best of people. At the time of their rebellion, the ex-ministers said Selinger was unable to rebuild trust among Manitobans after his flip-flop decision on raising the provincial sales tax (PST). The premier had promised in 2011 he would not increase the PST to eight per cent from seven per cent, but then did exactly that in July 2013. "We have had our differences, but I have come to appreciate Greg's compassion for people who are less powerful," Howard said on Wednesday. "I have watched him lead on bringing more refugees to Manitoba, even when there were voices that were opposed to that." The premier had only good words for Howard on Wednesday. "Jennifer has made a tremendous contribution to the people of Manitoba," he said. Howard championed more daycares in Manitoba, accessibility legislation and minimum wage issues, said Selinger. "I've always enjoyed my working experience with her. When we have disagreed, I found it was around key principles of what it is we want to do and how we do it. We've never disagreed about why we are here," he said. Christopher Adams, a political analyst in Winnipeg, said Howard's stated reason for leaving is generally code for bowing out gracefully. "She was saying that it's family reasons is why she's not running again. And in politics, that's usually the face-saving way by which people withdraw graciously," he said. Adams added that her exit is a serious blow for the NDP, which is faring poorly in public opinion polls. "They've lost somebody who was prominent, who had been a past cabinet minister, had come back from being one of the Gang of Five," Adams said. "By having her as part of the NDP team in this coming election, it meant there was some peace-building with the Gang of Five." Manitoba Liberal leader Rana Bokhari, who is running in Howard's riding of Fort Rouge, said she was surprised by her departure. "I think all of us recognize how much time she's put into that riding and how long she did serve the people of Fort Rouge. I wish her all the best," Bokhari said. At the same time, the Liberal leader said Howard's announcement won't change her campaign strategy. "I went in there knowing that she was there. Didn't stop me then, it's not stopping me now. It doesn't really change much for me in terms of my own strategy or what I'm going to continue to do," she said. Both Bokhari and Audrey Gordon, the Progressive Conservative candidate in Fort Rouge, said Howard's decision says more about Selinger's track record than anything else. "To lose Jennifer with less than 90 days remaining before the election is a very strong signal that Manitobans should take to heart," Gordon said. "Greg Selinger has lost the confidence of his best and brightest MLAs." Who will gain from the departure? Adams said he expects the NDP will recruit another high-profile candidate to run in Fort Rouge, but he added that the Liberals have the most to gain in this case. "Rana Bokhari is running in that riding. It's absolutely essential for the Liberals to win that riding," he said. "With Jennifer Howard not running, the Liberals are well-positioned to take that seat." But Adams said it would be a mistake to discount the NDP, which has been lagging behind Brian Pallister's PCs and the Liberals in recent polls, including a new poll published Wednesday morning. "The NDP, there are number of polls showing the NDP in third place. We've seen they're struggling in their home area of Winnipeg. So people are counting them out, but I think that's a mistake," Adams said. "Campaign fortunes can change very quickly. We haven't seen their strategy roll out. We have yet to see what their message is, but we can bet it will be anti-Pallister and we don't know what kind of traction that will have."